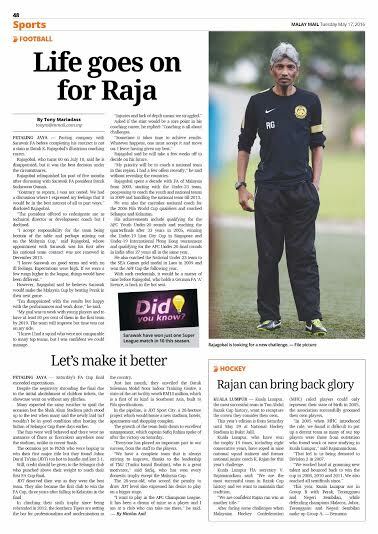 Parting company with Sarawak FA before completing his contract is not a stigma in Datuk K. Rajagobal’s illustrious coaching career. Rajagobal who turns 60 on July 10 said he is disappointed, but it was the best decision under the circumstances. The former Selangor and national winger, relinquished his post of five months after discussing with Sarawak president Datuk Sudarsono Osman. “Contrary to reports, I was not rested. We had a discussion where I expressed my feeling that it would be in the best interest of all to part ways,” disclosed Rajagobal. “The president offered to redesignate me as a technical director or development coach, but I declined. “I accept the responsibility for the team being at the bottom of the League table and perhaps missing out the Malaysia Cup,” said Rajagobal whose appointment with Sarawak was the first after his contract was not renewed with the national team in December 2013. However, Rajagobal said he believes Sarawak will make the Malaysia Cup by beating Perak in the next game. “I'm disappointed with the results but happy with the performance and work done," he said. “My goal was to work with young players and to have at least 80 per cent of them in the first team by 2019. The team will improve but time was not on my side. “I knew I had a squad who were not comparable to many top teams, but I was confident that we could manage. Asked if this stint would be a sore point in his coaching career, he replied: “Coaching is all about challenges. Rajagobal said that he will take a few weeks off to decide on his future. “My priority will be to coach a national team in this region. I had a few offers recently,” said Rajagobal without revealing the countries. Rajagobal spent a decade with the FA of Malaysia from 2003, starting with the national Under-23 team progressing to coach both the youth and national teams in 2009 and handling the national team till 2013. He was also the caretaker national coach for the 2006 Fifa World Cup qualifiers and has coached Selangor and Kelantan. His achievements include qualifying for the AFC Youth U-20 rounds and reaching the quarterfinals after 33 years in 2005, winning the Under-19 Lion City Cup in Singapore, Under-19 the same year International Hong Kong tournament and qualifying the AFC Under-20 final rounds in India after 27 years all in the same year. He also coached the National Under-23 team to the Sea Games gold medal in Laos after 20 years in 2009 and also winning the AFF Suzuki Cup after 14 years the following year. With such credentials, it would be matter of time before Rajagobal, who holds a German FA ‘A’ licence, is back in the hot seat.